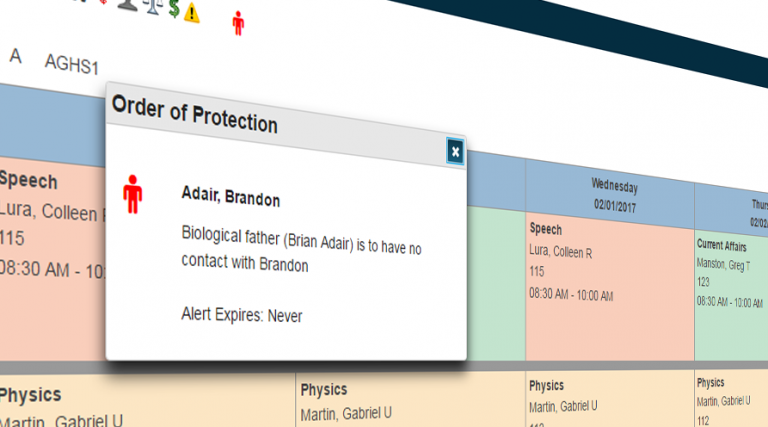 Custom Alerts allows system administrators to create student alert types entirely within the user interface. No more customizing wildcards, searching for tiny icons, or wondering how to get alerts onto the attendance pages. Custom Alerts places alert icons on every page with a single click and ships with over 650 icons and a full color palette. This plugin takes care of it all. Once an alert type has been created, office staff can enter alert information in a matter of seconds. Mark a student with an Order of Protection and remind all users who is not allowed to have contact with the student. Enter special education and 504 accommodations so every teacher knows exactly what a student needs. The possibilities are endless. The plugin also features alert reports and the ability to mass add or delete alerts for groups of students. Connect an alert to a student field, including legacy custom fields and database extensions. Create custom popup windows that show data from any fields. Trigger an alert based on PSHTML conditions or even tlist_sql queries. Check out the latest news on Custom Alerts. Custom Alerts is available through Marcia Brenner Associates. Contact MBA to schedule a demo and find out how this plugin can save you time and energy.